James Levine, shown leading the Boston Symphony Orchestra in 2007, has been suspended by the Metropolitan Opera following allegations of sexual abuse. Beyond his work at the Met, Levine has been a hugely influential figure in the classical music world for the past half-century — leading major orchestras, including the Boston Symphony Orchestra, and mentoring young musicians and opera singers at summer music programs such as the Ravinia Festival near Chicago. NPR's Anastasia Tsioulcas speaks with Mary Louise Kelly about the allegations, what they mean for the Met and some of the broader implications for classical music. Hear the conversation at the audio link. The Metropolitan Opera has suspended its longtime conductor and former music director following allegations of sexual abuse. 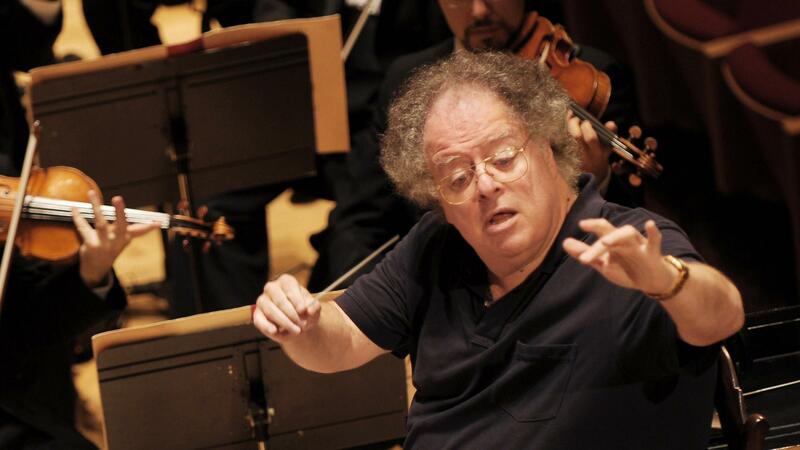 James Levine has been a hugely influential figure in the classical music world for half a century, leading major orchestras, including the Boston Symphony, and mentoring young musicians and opera singers at summer music programs. Joining us now to talk about the allegations and what this may mean for the Met is NPR's Anastasia Tsioulcas. Anastasia, thanks so much for being here. ANASTASIA TSIOULCAS, BYLINE: Hi, Mary Louise. Thanks for having me. KELLY: Lay out the basics for us. What are the allegations against Levine? TSIOULCAS: Well, there are three separate sets of allegations that have emerged, and they span from the 1960s to the 1980s. It's worth noting none of them take place at the Met, and in all the cases, the alleged victims were teenaged boys at the time. The first allegation was made public this weekend on Saturday when the New York Post published a story about a police report that was filed in Illinois just this past year. And the alleged victim told police that the abuse began in 1986 when he was just 15 years old and studying at a summer music program near Chicago called the Ravinia Festival. And yesterday, The New York Times named him as 48-year-old Ashok Pai. And The Times also published allegations from two other men - Chris Brown, who said that Levine abused him in 1968 when Brown was then a 17-year-old student and Levine was a 25-year-old teacher at another summer program in Michigan this time. And the third man making public allegations is James Lestock, who says that he was also first abused by Levine at that same program as Chris Brown the same year when he, too, was just 17 years old. KELLY: Stay with the timing issue for a minute. You mentioned that none of these incidents involved the Met. Do we know when the Metropolitan Opera became aware of these accusations? TSIOULCAS: Well, first a tiny bit of context - James Levine has been associated with the Metropolitan Opera for more than 40 years. And it's really important to know that there have been rumors circulating about James Levine and his behavior for literally decades in the classical music and opera world. But no one has come forward until now with alleged - with accusations. And the Met says it first learned of Ashok Pai's allegations in 2016 when police in Illinois contacted the Opera House. And the Met's administration asked Levine about the allegations, and he denied them. And that was that. But now the Met says it's going to launch an investigation after this weekend's media reports. KELLY: Do we know if any of the other orchestras or institutions that we mentioned - have they investigated Levine in the past? TSIOULCAS: Well, James Levine - he is an incredibly prominent man in this world. He's had many jobs and guest engagements all over the globe. And he was music director at the Boston Symphony Orchestra between 2004 and 2011. And yesterday, the Boston Symphony released a statement saying that it was never approached by anyone about inappropriate behavior. The Ravinia Festival also said it had no notice and that these are all new allegations and they are learning from these press reports. KELLY: Just quickly, where does this leave the Met? I mean, Levine was still actively conducting there. TSIOULCAS: He was. And his last performance there was this past Saturday afternoon literally hours before the New York Post and then The New York Times published their reports. And I really think as we saw with cases like that of Harvey Weinstein, it's possible that these allegations - these three sets of allegations might be among the first of a wave of allegations concerning Levine. And it has already very seriously damaged James Levine's reputation and his legacy. KELLY: OK. Anastasia, thank you. TSIOULCAS: My pleasure. Thanks for having me. KELLY: That's NPR's Anastasia Tsioulcas. Transcript provided by NPR, Copyright NPR.